What’s the collective noun for socks? 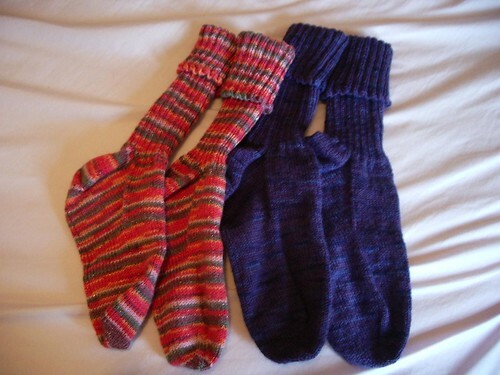 I have a couple of brace of socks to show off, knitted on trains, buses, watching TV or films, at gigs, waiting for weddings to start, and generally during any moment I have to sit still. Unfortunately I’m not allowed to knit at work, but I’m trying to get round it. They’re boring and mindless k2p2 rib – perfect for moments I’m actually trying to concentrate on something else. I think they’ll make good hiking socks, and hopefully appreciated by the recipients. Next up, a bag for my little neice. There’s nothing boring about them! Socks are next on my ‘things to learn how to do’ agenda. I’m going to have to be more adventurous with the next pair.